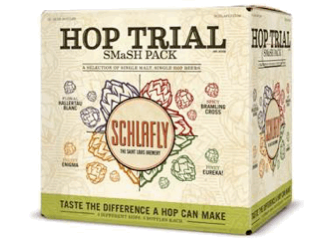 ST. LOUIS, Mo.—Schlafly Beer introduces the Hop Trial SMaSH Pack, an experimental new variety pack featuring four distinct hops, to launch today. This box offers beers featuring four different experimental hop varieties across the flavor spectrum with three bottles of each: Hallertau Blanc (floral), Bramling Cross (spicy), Enigma (fruity), and Eureka! (piney). The Hop Trial pack features four SMaSH (single malt and single hop) beers, which bring out the individual qualities of each ingredient, making the profile of the featured hop variety the true focus. For the first installment of the Hop Trial pack, the Schlafly team utilized well-known, established hops to introduce the concept of how to isolate a single varietal to the everyday beer consumer. In years to come, the team may explore more experimental hops from the brewery’s Hop Trial program (see more below). Last fall, the Schlafly team started soliciting consumer feedback on the Hop Trial hops. Every month, a different SMaSH Hop Trial beer is introduced on-draft at the brewpub locations, and consumers share their tasting notes on the Hop Trial Boards. This year’s Hop Trial beers have included varieties such as Michigan Cascade, 07270, a Steiner hop, HBC 291 from Yakima, WA, and more. After brewer and consumer feedback, these SMaSH beers have the potential to make next year’s variety pack. This past year, Schlafly has used 102 different hops within their portfolio. Additionally, the Hop Trial SMaSH Pack helps promote Schlafly’s Hop in the City event, which takes place Saturday, Sept. 17, noon-5 p.m. This annual event features more than 40 Schlafly beers, food, and live music; tickets go on sale Aug. 1. This is not the first time Schlafly has used off-premises packaging to promote one of its events; the brewery also released Walking Tree Wheat in conjunction with Art Outside this spring. The Hop Trial variety pack can be purchased at the Bottleworks or Tap Room locations as well as across Schlafly’s distribution area ($13.99 suggested retail). For more on Schlafly Beer’s distribution and products, visit www.schlafly.com/beers/distribution. About Schlafly Beer: Founded in 1991 in St. Louis, Schlafly Beer is the largest locally owned and independent craft brewery in Missouri, proudly offering more than 50 unique styles of craft beer. The celebrated brewing company continues to define craft with a dedication to sourcing the best ingredients, supporting local sustainability and community efforts whenever possible, and delivering a superior beer experience from year-round to limited-edition styles. In 2014, Schlafly Beer’s production of 60,000 barrels of beer took place between its two brewery-restaurants, Schlafly Tap Room (2100 Locust St.) in downtown St. Louis, and Schlafly Bottleworks (7260 Southwest Ave.) located in Maplewood. The Schlafly Tap Room was the first new brewpub to open in Missouri since Prohibition and is housed in a restored wood and brick building on the National Historic Register. Schlafly Bottleworks offers free weekend tours every Friday, Saturday, and Sunday from 12-5 p.m. on the hour, and every half hour on Saturdays. Schlafly Tap Room offers free brewery tours every Sunday. For a full listing of Schlafly Beers and for more information on distribution, visit www.schlafly.com. Find Schlafly Beer on Facebook, Instagram, and Twitter. In my case that I purchased I have 1 bottle that has a different bottle cap than all of the others. It is on a bottle of the Perle. It is blue and green and says Saint Louis Football Club. It has a Fleur-de-lis image in the middle. I just want to make sure my case wasn’t tampered with before I drink any of it. Please let me know.